This trick is used by many universities and schools worldwide to limit the internet access of their students in their computer labs. This post is for them who don’t how to impose these instructions and later in this post we will let our readers to know how to break this security and again gain all the restricted facilities. This security or we can say restrictions are imposed by a Firefox add-on “Public Fox”. • Locks down Add-ons, Preferences, 'about:config', Bookmarks. • Blocks unwanted Web Sites. Now after installing this add-on you will have to enter that central password to perform any of the above listed tasks. The above shown type of dialog box will appear in which the user will have to enter the central password to perform the desired task. Click here for the link to add this add-on to your Firefox. How to hack or disable this security if you are a student of one of such university or a school which uses this trick to restrict your access..!! To disable this security you just have to run Firefox in safe mode. Click Start button of your Windows O.S >> Programs >> Mozilla Firefox >> Mozilla Firefox (Safe Mode). 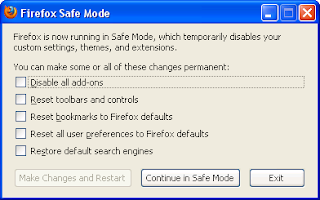 After you run Firefox in safe mode, their appears a dialog box with a number of check boxes for the actions you want to perform and in that list, very first option is to “Disable all add-ons”, mark the checkbox corresponding to this action and then hit the button “Continue in Safe Mode”. 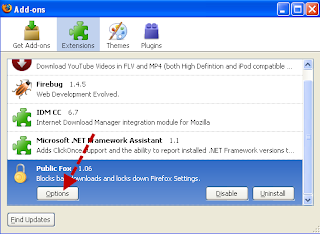 Now after this when Firefox gets open, all restricted accesses are again granted to you and now performing any of the task will not demand any central password, but if you want to permanently disable this security then from the menu bar of Firefox goto Tools >> Add-ons >> Extensions and now from the list of extensions , disable or uninstall “Public Fox”. After this every time you start Firefox and perform this above mentioned tasks, no password will be demanded.